This is probably the best kabob truck. The food is all quality and the portions are solid, but what sets it apart is the attention to detail. That means things like the slice of flatbread with the meal, the sumac spice sprinkled on the kebabs, and the extra touches for the rice and side dishes. The chickpeas actually had some spice to them, while the spinach side had red beans mixed in (sort of like Ghormeh Sabzi). Will definitely be picking this up again. The wait for the food was ridiculously long and they messed up several people's orders. We waited at least 1/2hr in the rain. Some people got their food before people who had ordered first. The workers didn't seem to care about making it right. The food itself was mediocre. The "mixed veggies" were a few overcooked broccoli sprouts and a carrot. None of the food tasted like much. Never going back. 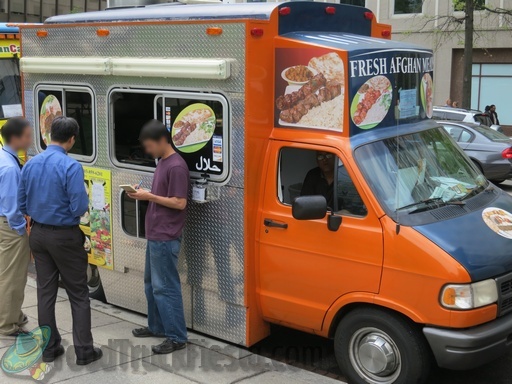 This is by far the best "kebab" truck that comes to the L'Enfant area (Kebabji is a close second). The chicken is always tender, flavorful and moist, unlike other trucks serving up overly dry and tasteless fare. Their spiced ground beef kebab is great too so the #3 combo is a good bet as it includes one chicken and one spiced beef kebab. Platters include two veggies, a very small salad, rice and a small piece of pita bread. They top the whole thing off with some spices just as I used to get in Istanbul. Yesterday I sampled an Afghan specialty called "montu" that is not normally on the menu; it's homeade dumplings made from thin dough, similar to a wonton, with spiced beef inside, topped with a yogurt sauce with garlic and dill. This is similar to the Turkish dish "manti" and was excellent. Fresh Afghan Meals is a big hit in our office. Its stands by its name... Fresh and tasty meals! i am regular. 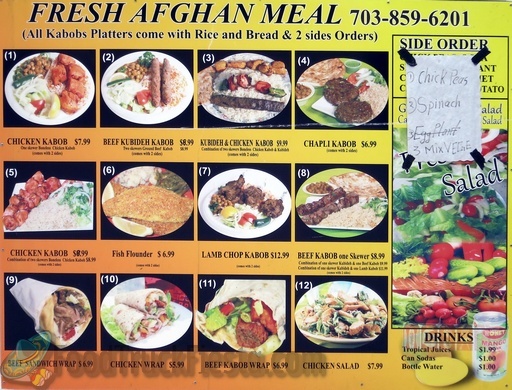 Afghan Fresh Meal food truck has been tweeting since March 29, 2012. They serve Afghan-style wraps, kabobs and gyros.